Happy Thelemic New Year, everyone! It's that time again, for the Office of the Readings. The Thelemic dates that you may see written online are arrived at by counting the number of 22-year cycles since 1904 to obtain the upper case Roman numeral, and then counting the years of the current cycle to get the lower case one. Within each 22-year cycle, many Thelemites ascribe the Major Arcana trumps of the Tarot to the years in order starting with The Fool and ending with The Universe. 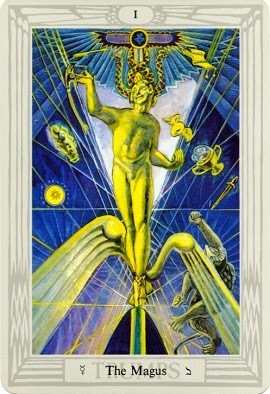 So the year that we're about to enter into is V:i and is thus attributed to the Magus card. This post will remain the top article here for the duration of the Thelemic High Holy Days, from March 20th to April 10th. The Rite of the Office of the Readings is performed for all of the readings beginning on March 20th. This year I'm pleased to announce the the Office of the Readings will be presented at Leaping Laughter Lodge, the Minneapolis local body of Ordo Templi Orientis. I'm looking forward to offering this series to the larger local OTO community. In order to synchronize our series with the Lodge's equinox ritual scheduled for March 21st, the Invocation of Horus will precede the Office for the second night rather than the first. Also, this year the Prologue of the Unborn will be read preceding the ritual for March 20th rather than on March 19th. In addition to those changes, we've revised the order of readings and created a new Lectionary. Generally speaking, the First Readings have remained the same as in previous years, but a number of the Second Readings have been rearranged. We also have standardized the series to have two readings per day rather than the old version that had more on some days. Liber VII, Prologue of the Unborn (Preceding the Ritual). From "The Four Zoas" by William Blake. From "A Mithraic Ritual" Translated by GRS Mead. From “Dark Night of the Soul”, Book II, Cap 8 by San Juan de la Cruz. Liber Tzaddi vel Hamus Hermeticus. From the “Tao Te Ching” by Lao Tzu, Cap 37 and 39. From Liber CDXVIII, The 16th Æthyr. Relevant to Liber A'ash is my solution to the mystery of the duck. From Liber CXI, Cap 174-175. From “The Vision of the Universal Mercury” by G.H. Frater S.R.M.D. From Liber CXI, Cap 192-194. "I. N. R. I." by Frater Achad. Selections from “The Spiritual Guide” by San Miguel de Molinos. From Liber CDXVIII, The 20th Æthyr. "The Emerald Tablet of Hermes" by Hermes Trismegistus. From “The Daughter of Fortitude” Received by Edward Kelly. Liber Cheth vel Vallum Abiegni. "Maha Prajnaparamita Hridaya Sutra" (The Heart Sutra, Buddhist text. Translation by the Kuan Um School of Zen). From Liber DCCCXXXVII, The Law of Liberty. From “On Christ and Antichrist” by Hippolytus, Cap 2. From “The Thunder, Perfect Mind” (Gnostic text). From Liber CDXVIII, The 7th Æthyr. “Vajrasattva, Primordial Buddha of Diamond or Rainbow Light” From Songs and Meditations of the Tibetan Dhyani Buddhas. “Visvapani, The Bodhisattva and Spiritual Emanation of Amoghasiddhi” From Songs and Meditations of the Tibetan Dhyani Buddhas. From Liber CDXVIII, The 22nd Æthyr. If you would like to perform this series and have questions, feel free to e-mail me here. All Office of the Readings posts may be viewed here. Our Office of the Readings series is based on this ritual series by the Companions of Monsalvat.